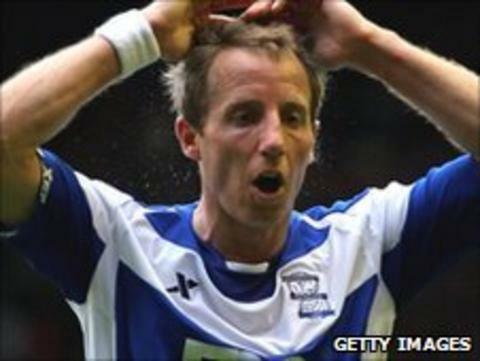 Midfielder Lee Bowyer has joined Ipswich Town on a free transfer after his contract expired at Birmingham. The 34-year-old, who has amassed over 600 appearances for Charlton, Leeds, Newcastle and West Ham has signed a one-year deal. "I'm looking forward to trying to get Ipswich back in the Premier League," said Bowyer. Bowyer joins new signings Michael Chopra, Nathan Ellington and Ivar Ingimarsson at Portman Road. Ipswich boss Paul Jewell believes Bowyer, who played in Birmingham's Carling Cup victory over Arsenal at Wembley in February, will add some much-needed experience to his squad. "We're obviously delighted to have signed a player of Lee's quality," said Jewell. "Anyone who has seen Lee play over the years knows he is a winner and he will bring that winning mentality into our dressing-room."